This article is about a city in Telangana, India. For its namesake district, see Warangal (urban) district. 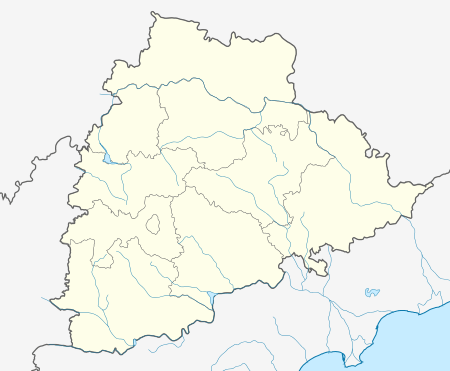 Warangal pronunciation is a city and the district headquarters of Warangal (urban) district in the Indian state of Telangana. It is also the mandal headquarters of Warangal mandal in Warangal revenue division. As of 2011 census of India, the city had a population of 811,844, making it the 2nd most populous in the state. Warangal is one among the 12 heritage cities in the country chosen for Scheme HRIDAY – Heritage City Development and Augmentation Yojana by Government of India. It is also selected as a smart city in the "fast-track competition", which makes it eligible for additional investment to improve the urban infrastructure and industrial opportunities under Smart Cities Mission. During Kakatiyan rule, the city was referred to as Orugallu. It was also known as Vorakalli, Tolini Koranakula and Akshalinagaram. Aravabinakosam, a literary work of Ragunatha Bhaskar mentioned Warangal as Ekasilanagaram. 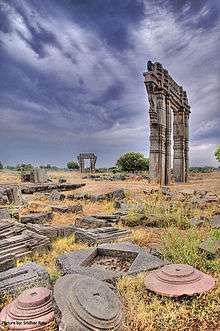 Warangal, then known as Orugallu, was the capital of the Kakatiya dynasty from 1195 CE until that ruling family was defeated by the Delhi Sultanate in 1323. The city was then renamed as Sultanpur. Kakatiya Period Inscriptions praised Warangal as best city within all of Andhra up to shores of the Ocean. The Kakatiyas left many monuments, including an impressive fortress, four massive stone gateways, the Swayambhu temple dedicated to Shiva, and the Ramappa temple situated near Ramappa Lake. The cultural and administrative distinction of the Kakatiyas was mentioned by Marco Polo. After the defeat of Prataparudra II, the Musunuri Nayaks united 72 Nayak chieftains and captured Warangal from Delhi Sultanate and ruled for fifty years. After the demise of the Nayaks, Warangal was part of the Bahmani Sultanate and then the Sultanate of Golconda. Warangal is located at 18°00′N 79°35′E﻿ / ﻿18.0°N 79.58°E﻿ / 18.0; 79.58. It has an average elevation of 302 metres (990 feet). It is settled in the eastern part of Deccan Plateau made up of granite rocks and hill formations which left the region barren making the cultivation depend on seasonal rainfalls. There are no river flows nearby warangal, which makes it to rely on Kakatiya Canal which originates from Sriram Sagar Project to meet the drinking water requirements. Located in the semi-arid region of Telangana, Warangal has a predominantly hot and dry climate. Summer starts in March, and peak in May with average high temperatures in the 42 °C (108 °F) range. The monsoon arrives in June and lasts until September with about 550 mm (22 in) of precipitation. A dry, mild winter starts in October and lasts until early February, when there is little humidity and average temperatures in the 22–23 °C (72–73 °F) range. Many hill rocks and lakes are located around warangal. Padmakshi hill and Govinda Rajula Gutta are two famous hills with temples. Bhadrakali Lake and Waddepally Lake are the two famous lakes which adds scenic beauty and also are the major sources of drinking water. Greater Warangal Municipal Corporation is the civic body of the city, which oversees the civic needs. The GWMC covers an area of 407.77 square kilometres (157.44 sq mi). City planning is governed by the Kakatiya Urban Development Authority, which was constituted in 1982. The body oversees development of infrastructure and other projects in the city. Warangal has two railway stations namely, Kazipet and Warangal on the important New Delhi-Chennai main line of Indian Railways. They are administered under the jurisdiction of the Secunderabad railway division of South Central Railway zone. Kazipet Junction shelters both Electric and Diesel Loco sheds with a capacity of holding 175 and 142 locomotives. 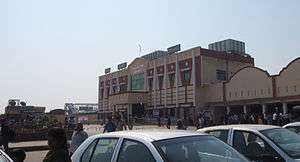 Vanchanagiri, Hasanparthy Road railway station are the other railway stations within the city limits. The construction of third railway line between Balharshah and Kazipet was sanctioned at an estimated cost of ₹24.032 billion (US$360 million). 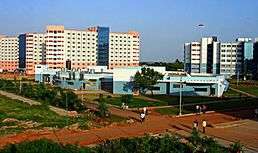 Kakatiya University and Kaloji Narayana Rao University of Health Sciences are two universities in the city. Other notable educational institutions include NIT Warangal, Kakatiya Institute of Technology and Science, Vaagdevi College of Engineering, Ramappa Engineering College, and Kakatiya Medical College. The residents of the city are often referred as Warangalites. The Warangal Fort, Thousand Pillar Temple and Ramappa Temple are the World Heritage sites recognised by UNESCO. Bhadrakali Temple, Padmakshi Temple, Kazipet Dargah are other notable destinations of various religions. Bhadrakali Lake, Laknavaram Lake, Pakhal Lake, Ramappa Lake are the water bodies notable for tourism. 1 2 "Warangal Municipal Corporation, Budget 2014–15". Greater Warangal Municipal Corporation. Retrieved 4 February 2015. ↑ "District Census Handbook – Warangal" (PDF). Census of India. p. 14. Retrieved 21 May 2016. ↑ "Warangal District Mandals" (PDF). Census of India. p. 83. Retrieved 21 May 2016. ↑ "Warangal | Heritage City Development and Augmentation Yojana (HRIDAY)". hridayindia.in. Retrieved 2016-07-13. ↑ "Lucknow, Warangal among 13 smart cities announced by govt.". The Hindu. 2016-05-24. ISSN 0971-751X. Retrieved 2016-07-13. ↑ Rao, Gollapudi Srinivasa (2016-08-20). "No takers for district status for Hanamkonda". The Hindu. ISSN 0971-751X. Retrieved 2016-10-15. ↑ "History of Warangal Municipal Corporation". Official website of Warangal Municipal Corpoation. Retrieved 20 May 2016. ↑ Eaton, Richard M. (2005). A Social History of the Deccan: 1300–1761. Cambridge University Press. pp. 17–21. ISBN 978-0-521-25484-7. ↑ Cynthia, Talbot (2001-09-20). Precolonial India in Practice: Society, Region, and Identity in Medieval Andhra. Oxford University Pres. p. 37. ISBN 9780198031239. ↑ "Deccan Plateau, Andhra Pradesh – Things to do in Andhra Pradesh". Retrieved 28 July 2015. ↑ "Three towns in the grip of water crisis". The Hindu. Retrieved 28 July 2015. ↑ "Drinking Water". Retrieved 28 July 2015. ↑ "Govindarajula Gutta, Warangal India: Find Timings, History and review of Govindarajula Gutta". Retrieved 28 July 2015. ↑ "About – Welcome to Padmakshi Temple". Retrieved 28 July 2015. ↑ D. Thhatikkonda. "Lake Water Quality and its Interaction with Aquifers in Warangal City". Retrieved 28 July 2015. ↑ Gopi, K.N (1978). Process of urban fringe development: A model. Concept Publishing Company. p. 25. Retrieved 6 August 2013. ↑ Iyer, Neelakantan Krishna; Kulkarni, Sumati; Raghavaswam, V. (13 June 2007). "Economy, population and urban sprawl a comparative study of urban agglomerations of Banglore and Hyderabad, India using remote sensing and GIS techniques" (PDF). circed.org. p. 21. Retrieved 10 December 2012. ↑ "Cities having population 1 lakh and above, census 2011" (PDF). Government of India. 2011. p. 11. Retrieved 10 December 2012. ↑ "Welcome to Warangal Municipal Corporation". Ourwmc.com. 18 August 1994. Retrieved 19 April 2014. ↑ "Kakatiy Urban Development Au". Kuda.in. Retrieved 19 April 2014. ↑ Special Correspondent (11 October 2012). "Drive to keep Warangal clean". The Hindu. Retrieved 19 April 2014. ↑ "Warangal model for solid waste management". The Hindu. 20 June 2013. Retrieved 19 April 2014. ↑ "Warangal to Get Police Commissionerate". The New Indian Express. ↑ "వరంగల్.. ఇక పోలీసు కమిషనరేట్". Retrieved 28 July 2015. ↑ "Jurisdiction of Police Stations". Retrieved 28 July 2015. ↑ "MGM (Mahatma Gandhi Memorial) Hospital in Warangal – Sehat". Retrieved 28 July 2015. ↑ "Biomedical wastes pose a threat to lives". www.deccanchronicle.com. ↑ "High growth North yet to match spatial spread of South, West". The Indian Express. 7 April 2014. Retrieved 15 June 2014. ↑ "Detailed Profile Of The Project". Irrigation.cgg.gov.in. 23 May 2003. Retrieved 19 April 2014. ↑ "Enumamula Village, Hanamkonda Mandal, Warangal". India Growing. Archived from the original on 26 March 2014. Retrieved 19 April 2014. ↑ Special Correspondent (3 February 2014). "STPI-Warangal woos investors". The Hindu. Retrieved 19 April 2014. ↑ Press Trust of India (19 February 2016). "IT Incubation Centre inaugurated in Warangal". Business Standard. Retrieved 5 July 2016. ↑ "Bus Stations". TSRTC. Retrieved 20 May 2016. ↑ "Guntur still awaits city RTC services". The Times of India. Retrieved 28 July 2015. ↑ "KARIMNAGAR-District Panchayat". Retrieved 28 July 2015. ↑ "ELS / KZJ". South Central Railway. Retrieved 15 October 2016. ↑ "New rail line between Kazipet and Ballarshah - Times of India". The Times of India. Retrieved 2016-10-15. ↑ "Nizam-era airport lies neglected - Times of India". Retrieved 2016-07-13. ↑ "Mamnoor airport to function only after 2030". Deccan Chronicle. 21 September 2014. Retrieved 15 October 2016. ↑ "Paying tribute to new State in style". The Hindu. 2 June 2015. Retrieved 15 October 2016. ↑ Centre, UNESCO World Heritage. "The Glorious Kakatiya Temples and Gateways - UNESCO World Heritage Centre". whc.unesco.org. Retrieved 28 June 2016. ↑ "Regions ::: Visit Telangana - Official Tourism Information for Telangana". www.telanganatourism.gov.in. Retrieved 28 June 2016. ↑ "Destination Warangal". The Hindu. 2015-08-06. ISSN 0971-751X. Retrieved 2016-07-13. ↑ "Warangal City Population Census 2011 – Andhra Pradesh". ↑ Special Correspondent. "Bathukamma: Festivities in the air". The Hindu. Retrieved 28 July 2015. ↑ Gollapudi Srinivasa Rao. "Bathukamma festivities to begin from Sept. 24". The Hindu. Retrieved 28 July 2015. ↑ "Bonalu, Bathukamma declared state festivals". The Times of India. Retrieved 28 July 2015. ↑ "City Of Warangal » Harees popular than Haleem in Warangal". City Of Warangal. Retrieved 28 July 2015. Wikimedia Commons has media related to Warangal.